In most resource-poor settings, the access to and the ability to perform medical tests like blood counts and blood smear examinations needed to treat HIV and malaria are limited. Even in these resource limited areas, the ever-increasing user circle of mobile phones and vast coverage of mobile network is a reality. The need of hour is to develop the capacity to analyse the specimens in a simple and cost effective way requiring minimal training. Hence, mobile phones, the 11th finger in everyone's hands have been chosen and adapted for diagnostic technologies, namely Cellscope and Cellophone Both these inventions have bagged prizes in Vodafone Foundation’s Wireless Innovation Project this year. A project that began as a challenge to Dan Fletcher’s undergraduate students at the University of California, Berkeley has transformed a mobile phone into a diagnostic tool for malaria with a goal to bring modern diagnostic testing to remote areas cheaply and effectively via telemicroscopy. The Cellscope is a device that is attached to the digital camera of a mobile phone effectively turning it into a microscope. The Cellscope can show individual white and red blood cells and with the correct stain it can be used to identify the malarial parasite. This image could then be transmitted directly over the mobile network and so provide assistance with remote diagnosis and monitoring . 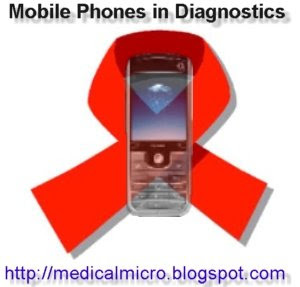 This invention can be exploited for diagnosis which requires a high quality image such as malaria and TB. More information on Cellscope can be found here. Cellophone Project was developed with an aim to provide a revolutionary optical imaging platform to be used specifically to analyse bodily fluids within a mobile phone. The technology advanced by Dr. Ozcan and his team relies on Lensfree Ultra-wide field Cell monitoring Array platform (LUCAS) and is based on shadow imaging. Shadow imaging of cells and bacteria relies on the detection of their shadow signature – the pattern of diffraction of waves by cells. Each type of cell has a specific electronic signature, or ‘shadow’, that can be detected. No bulky attachments or components or lenses are needed and it can immediately monitor an ultra-large field of view by detecting the holographic shadow of cells or bacteria of interest on a chip. Through advanced signal processing tools that are running at a central computer station, the unique texture of these cell/bacteria holograms will enable highly specific and accurate medical diagnostics to be performed even in resource-poor settings by utilizing the existing wireless networks. For more information on Cellophone, Click here.